Disapointing third-quarter earnings results from Celgene is not only dragging its stock down but the biotech sector as well. Celgene's (CELG - Get Report) steep decline on Thursday has both winners and losers. Shares of the biotechnology company were sinking over 19% in afternoon trading on Thursday after it reported third-quarter earnings below analysts' expectations, and slashed its 2020 forecast. The disappointing earnings and subsequent decline of Celgene is having a negative impact on the biotech sector as a whole. Shares of the iShares Nasdaq Biotech ETF (IBB - Get Report) are down over 2.2% in Thursday afternoon trading. But, Celgene short-sellers are cleaning up after the disappointing results, up $183 million in mark-to-market profits Thursday, according to analytics firm S3 Analytics. Short positions within the biotech sector have been growing throughout the year, up 25% domestically and 26% worldwide, even despite a 19% jump in the IBB and a 39% spike in S&P Biotech stocks. But, with "today's sector-wide price weakness, the top five shorts in the Biotech sector have added $273 million of mark-to-market profits today, bringing their October profits up to $673 million," S3 noted. "The top five are still down $399 million year-to-date but have recouped 63% of their losses this month." 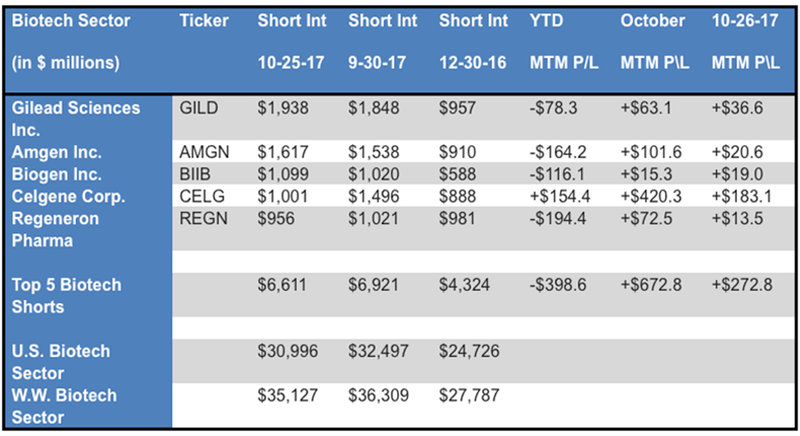 That said, "Celgene short sellers were the only ones of the top five that had substantial short covering this month, with buying to cover 1.9 million shares in October resulting in missing out on an addition $41 million of mark-to-market profits today," the firm added.